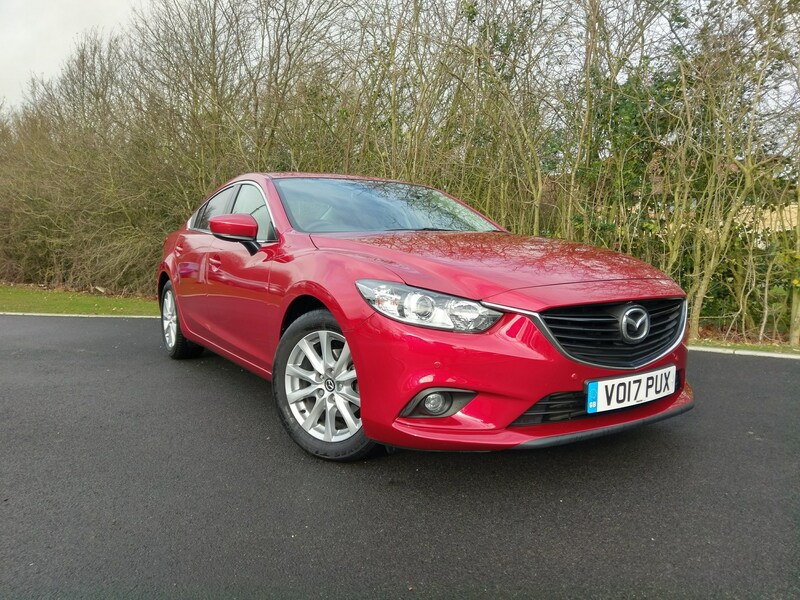 It has been a year since we welcomed the Mazda 6 onto our long-term test fleet and, at the time, it was a recently facelifted model. Now, as it goes back, Mazda has announced another facelift for the car, which will be available later in the year. The biggest change is in specification. Where our SE-L Nav model was ranked third out of the four available trims, on the new car SE-L will be the base model. It gains LED headlights and a host of assistance features such as lane keep assist, blind spot monitor and adaptive cruise control – things we would have liked to have had fitted on our car. Prices have increased by around £1,000 (like-for-like) but the new model promises greater refinement and greater luxury. We covered 12,000 pain-free miles in our car. It never let us down or needed any maintenance. Our average fuel economy was on par with the Equa Index at 53mpg, although a period of regular town driving saw the figure plummet to the low 40s. The 6 is most at home on the motorway where its 2.2-litre diesel engine has plenty of torque and makes for an effortless cruise. On country lanes, the 6 is more adept than its rivals with impressive dynamics making for an enjoyable driving experience. We were disappointed by its halogen headlamps, which were too dim for unlit country lanes, and found its heating system struggled to de-mist the windows on a cold morning. The sat-nav system was more impressive, with speed camera alerts and live traffic updates. One thing that really stood out was just how quiet its diesel engine was at idle and the flexibility of the engine on the move made it feel like a petrol, with a broad power range. 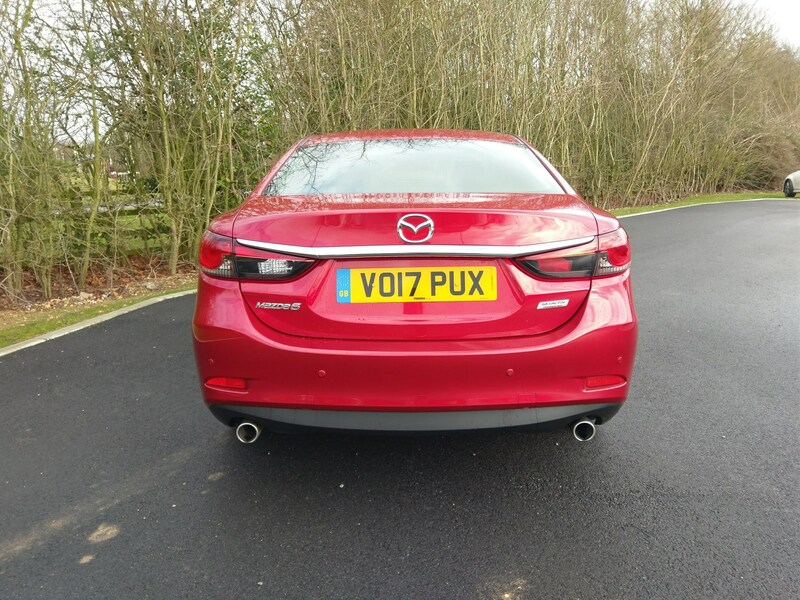 The Mazda 6 is under-rated and should be a serious contender for those considering rivals such as the Ford Mondeo and Vauxhall Insignia. If the new model builds on the already excellent package, it should be a no-brainer choice for many. Much like the national statistics reveal how much time people lose each year due to sitting in traffic jams, so I can measure time lost waiting for the Mazda 6’s heater to clear the front and rear windscreens. I can’t say how long exactly because I’ve yet to find the patience to sit on my drive until the front windscreen fully demists, resulting instead to a few hasty swipes with a cloth to circumvent the process. Certainly, the rear window is still not completely clear five minutes into my journey. If time is precious, then perhaps this is not the car for you. However, in many ways, that would be a shame because the Mazda 6 has much going for it. Undeniable one of the most attractive looking cars in its segment, it offers an engaging, agile drive – fun to drive with sporty road manners – and a refined, yet powerful, 2.2-litre diesel engine with plenty of mid-range oomph. From start-up, the engine is one of the quietest on the market and, while first impressions of the steering are that it is a little light and frothy, you quickly become accustomed to the feel of the car. Well-equipped in SE-L Nav trim, mid-to-high 50s fuel consumption is possible on longer journeys, although high 40s is more likely when a mix of commuting is added. It’s a way off the official 68.9mpg but close to the Equa Index’s 53.1mpg. 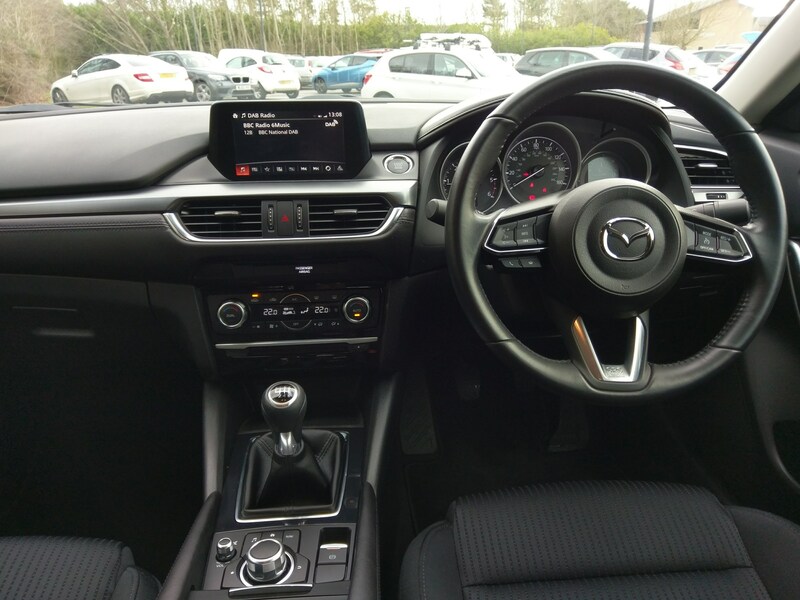 Despite approaching eight years old, albeit with a couple of facelifts/updates since that transformed the interior with higher quality materials, fewer buttons and an improved infotainment system, the Mazda 6 remains one of the best in its class. Winter was in full swing as I took the keys to our long-term Mazda 6 and, after brushing off a modest covering of snow, I was disheartened to learn that our SE-L spec car doesn’t come with all-important heated seats. Mazda doesn’t offer optional extras across the 6 range so the only way to enjoy a warm bottom is to opt for a range-topping Sport Nav – costing £2,500 more. While it may seem inconsiderate of Mazda to expect drivers to manage without such ‘crucial’ equipment, this is a sales model we should expect to become commonplace as manufacturers have to battle with revised emissions testing. All new cars must be tested for each configuration of equipment, potentially leading to hundreds of tests required for a single model. Seat has just announced a similar ‘trim-only’ choice for its new Arona model for this reason. Once I’d warmed up using the 6’s climate control system I started to get a feel for what Mazda calls ‘Jinba Ittai’ or ‘car and driver in perfect harmony’. 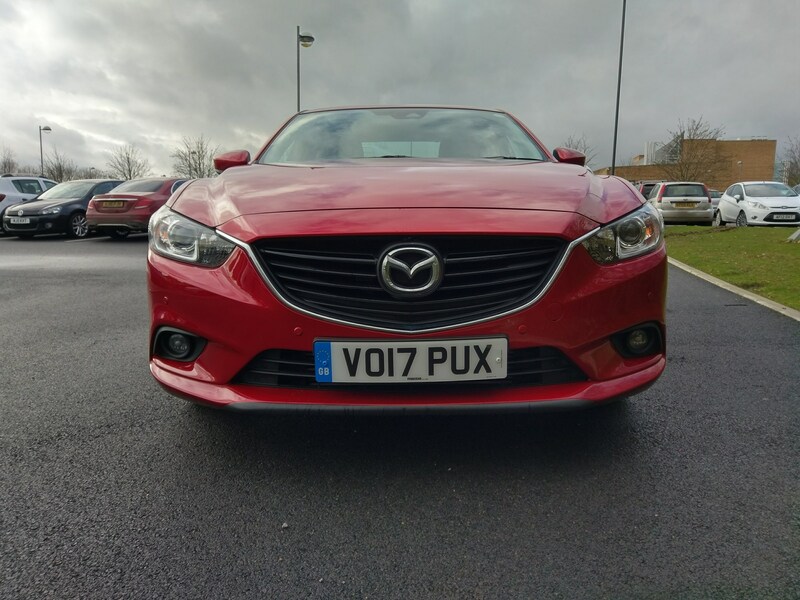 At first, I thought the car’s steering was far too light, but after settling in for a few miles it became apparent that the Mazda is a really great car to drive. It isn’t particularly fast or sporty and the limits of grip in the wet are relatively easy to uncover, but for outright ‘feel’ there is very little that can compete. The car is very easy to predict and very precise, so you can always judge perfectly how it will respond – be it braking distance, acceleration or cornering ability. Mazda says you should feel at one with the car, like a horse and rider, and you really do. This isn’t about driving like a ‘hooligan’ either, the sense of attachment is there at all speeds making for a relaxing and enjoyable ride – even if it starts off a bit cold. The Mazda 6 has been put through its paces as part of our long-term test fleet, but how does it compare to some rivals? The Ford Mondeo, Vauxhall Insignia and Volkswagen Passat are dominant players in this sector. However, the Mazda 6 comfortably holds its own when viewed alongside similar derivatives of these popular fleet models. Our test car is powered by Mazda’s 2.2-litre (150PS) diesel engine and delivers 107g/km. That’s the same CO2 as the Mondeo 2.0TDCi Eco 150 Zetec – the equivalent of 68.9mpg. In fact the Mazda 6 and the Mondeo have the most frugal engines across the four, with the Passat 2.0TDI 150 S a marginally higher 109g/km (67.3mpg) and the Insignia Grand Sport 1.6 EcoTec Sri VX Line Nav offering 114g/km (65.7mpg). From a benefit-in-kind (BIK) perspective, it means a Mazda 6 driver will pay 23% this tax year, rising to 25% in 2018/19 and 28% in 2019/20. With a P11D price of £24,100, that would equate to £1,109 for a 20% taxpayer this financial year. Employers would have to pay £140 in Vehicle Excise Duty (VED) and £765 in Class 1A NICs. However, a Mondeo driver would pay slightly less (£1,005), thanks to a lower P11D price of £21,850. An employer would pay the same VED costs and £694 in Class 1A NICs, according to the Fleet News company car tax calculator. With a P11D price of £24,240, the Passat driver would pay the most, £1,115 this financial year. VED would be same, while Class 1A NICs of £769 would also be the highest across the four. Meanwhile, the Insignia’s P11D price of £22,745 helps keep both employer and employee costs down despite falling into a higher BIK bracket. The driver would pay £1,092 this financial year. VED would be the same and Class 1A NICs would be £753. Analysis of all-important running costs put the Mazda 6 at the bottom of the pile. Not by much, but taking into consideration depreciation, service, maintenance and repair (SMR) and fuel, based on a four-year/80,000 mile cycle, its running costs would be 35.24 pence per mile (ppm). The Passat comes out slightly better at 35.12ppm, but behind the Mondeo at 32.93ppm and the Insignia, which costs 32.08ppm. As a four-door saloon, the Mazda 6 is something of a rare breed. Hatchbacks and estates have proved the popular choice in recent years so Mazda’s decision to favour a saloon seems surprising. 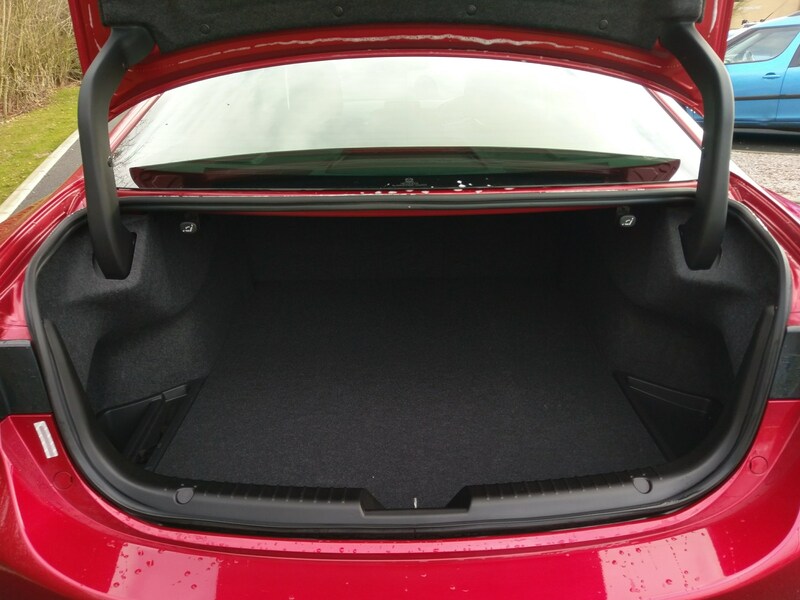 While the previous Mazda 6 had a 500-litre boot, this latest model has a narrower opening and can carry just 483 litres behind the rear seats, smaller than some of its competitors. Pop the rear seats down however, and the Mazda can carry 1,632 litres of luggage – a figure that’s much more competitive with the best in class. The fact is, despite its large size and length, Mazda has prioritised style and agility in the Mazda 6 over space for your luggage. I’m not about to complain about that. Mazda’s company car credentials are strengthened thanks to its Skyactiv technology which delivers low emissions without sacrificing power. Introduced in 2011, it was driven by a desire to increase fuel efficiency, while retaining a degree of driving pleasure. Engineers at the Japanese manufacturer designed a lightweight, but rigid, platform, improved transmissions and developed engines which squeeze far more energy from every drop of fuel. Our test car is powered by Mazda’s 2.2 (150PS) diesel engine which delivers 107g of CO2/km. To put that in context, the Kia Picanto, which is a city car, delivers 101g/km from a 1.0-litre petrol engine. Mazda claims the Skyactiv-D provides a fuel economy improvement of 20% over conventional diesel engines. The combined fuel economy on our test car has been hovering around the 46mpg mark against a claimed combined of 68.9mpg – a 30% shortfall. From a benefit-in-kind (BIK) perspective, it means a company car driver will pay 23% this tax year, rising to 25% in 2018/19 and 28% in 2019/20. With a P11D price of £24,100, that would equate to £1,109 for a 20% tax-payer this financial year. Employers would have to pay £140 in Vehicle Excise Duty (VED) and £765 in Class 1A NICs. Running costs, taking into consideration depreciation, service, maintenance and repair (SMR) and fuel, based on a four-year/80,000 mile cycle, would be 35p per mile (ppm). It is also worth noting that if you reimburse your company car drivers according to Government advisory fuel rates (AFRs), that frugal engine could prove beneficial to them. The 2.2-litre engine falls into the highest bracket, giving drivers 12ppm. The Mazda 6 proved a family saloon can be fun to drive when it was put through its paces on a 400-mile return trip to the Lake District. On the motorway, it delivered a comfortable, relaxing ride, helped by new engine noise reduction technology and no shortage of passenger space. The 2.2-litre Skyactiv-D engine, with emissions of 107g/km, was able to cruise effortlessly at 70mph, while returning a not too shabby 58mpg against a claimed 78.3mpg. But, perhaps unusually for a family four-door saloon, it was equally at home on the national park’s winding roads. The ride was firm and it cornered really well for such a large car, thanks in part to some new tech from the Japanese manufacturer. Called G-Vectoring Control (GVC), the system gives you much more confidence when cornering as it momentarily reduces the amount of torque delivered to the front wheels, thereby transferring a fraction more weight onto the front axle which allows the front wheels to turn more precisely. However, all that fun did come with an expected fall in fuel economy. Negotiating the park’s more rural roads returned 39mpg against the official urban figure of 56.5mpg – a 30% shortfall. Nevertheless, that was still impressive, when the combined fuel economy has been hovering around the 46mph mark against a claimed combined of 68.9mpg. Mazda hopes this extra focus on sportiness will pay dividends and judging by this latest outing for our test car, the Japanese manufacturer could be right. 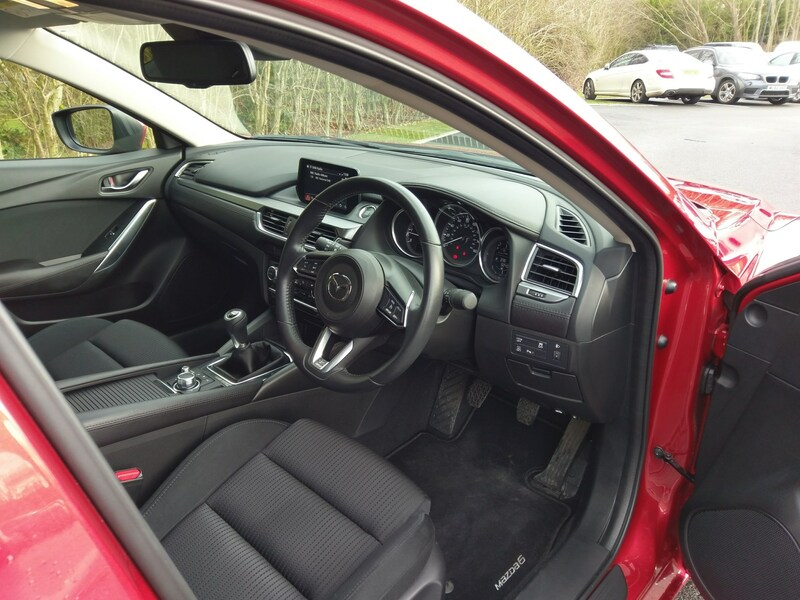 The Mazda 6 saloon and tourer benefited from a host of updates last autumn, with two key improvements to the 2.2-litre Skyactiv-D engine. Transient Control and Mazda’s Natural Sound Smoother technology (NSS) aim to increase responsiveness and reduce engine noise. By cutting turbo lag and boosting torque, Transient Control aims to provide a more positive throttle response which it certainly delivers. The 2.2-litre engine produces 150PS at 4,500rpm, but thanks to its Skyactiv technology emissions have been kept to an impressive 107g/km, giving a claimed combined of 68.9mpg. However, our test car is achieving 44.7mpg – a 35% shortfall. Meanwhile, the introduction of Mazda’s NSS technology is designed to reduce diesel knock noise during starting and low-speed acceleration. NSS suppresses resonance from the piston and connecting rod by using a dynamic damper inside the piston pin to suppress the three critical frequency bands in which engine components typically vibrate most loudly. Having spent the past couple of days with the radio on mute, it definitely delivers a quieter cabin compared to some other diesels. It is complemented by improvement in sound insulation, including the adoption of upgraded door seals, tighter tolerances between panels and sound deadening materials added to the underbody, rear console, headliner and doors, while laminated front side windows further suppress wind noise. A further update is G-Vectoring Control (GVC) which gives you much more confidence when cornering. By monitoring your steering and throttle position when you enter a corner under power, GVC momentarily reduces the amount of torque delivered to the front wheels, thereby transferring a fraction more weight onto the front axle which allows the front wheels to turn more precisely. Inside, there is a new leather steering wheel that on Sport Nav models is heated. Other premium upgrades to Sport Nav models include an enhanced head up display that features colour and Traffic Sign Recognition (TSR) for the first time, plus electric memory seats that now also adjust the head-up display. It may sound like something you would find in a fighter jet rather than a four-door saloon, but G-Vectoring Control (GVC) is now a mainstay of this fleet favourite. By monitoring your steering and throttle position when you enter a corner, GVC momentarily reduces the amount of torque delivered to the front wheels, thereby transferring a fraction more weight onto the front axle which allows the wheels to turn more precisely. The result is a car which handles really well, giving you bags of driving confidence. Coupled with a 2.2-litre diesel engine and with 150PS or 175PS versions available, this is a fun car to drive. Both diesels use a two-stage turbocharger, with two turbines and a large intercooler, producing excellent torque – even at low revs. The Mazda6 has now covered 2,000 miles and my average fuel consumption has nudged up to 48.4mpg. While this is an improvement it is still some way off Mazda’s claim of 68.9mpg, although it is close to the Equa Index’s real-world figure of 53.1mpg. The Mazda6 is generously equipped. The entry-level SE comes with air-con, 17-inch alloy wheels, leather gear lever and steering wheel, cruise control and a seven-inch colour touchscreen infotainment system with digital radio, Bluetooth and a USB connection. The car has a sleek and powerful look on the outside and a premium feel inside. It is pleasurable and responsive to drive. The boot is generous at 480 litres, however the opening is fairly narrow so bulkier items simply won’t fit in. The newest addition to our fleet brings with it a degree of deja-vu given that in 2013 we ran the then-new Mazda 6 on long-term test. Having undergone two facelifts – we thought we’d give it another try to see if it can still shape up compared to competition from the Vauxhall Insignia and Škoda Superb. Visually very little has changed – our new car even comes in the same shade of metallic Soul Red (£680 option), but that is no bad thing as the Mazda 6 is a fine-looking saloon. The real difference in this model is under the skin. Mazda continues to prioritise driver engagement in its cars, so the focus has been on improving refinement and handling. Mazda has developed new technology called G-Vectoring Control which moderates engine torque while cornering. It allows the car to optimise its weight balance as the driver steers and ensures the 6 delivers nimble handling. Two engines are available: a 2.0-litre Skyactiv-G petrol with 145PS or 165PS and a 2.2-litre 150PS or 175PS Skyactiv-D diesel. Our model is the 2.2-litre 150PS diesel in SE-L-Nav trim costing £24,295. This is the most popular model chosen by fleets and it emits 107g/km of CO2 with average fuel consumption of 68.9mpg. By avoiding the trend to downsize, Mazda’s diesel is now one of the largest in the sector. Rivals like the Insignia, Mondeo and Superb are all available with much lower-capacity engines. However, in like-for-like comparisons the difference in benefit-in-kind (BIK) tax is marginal. A similarly specced 1.5-litre Mondeo would only save the driver £100 a year. The advantage of the larger engine is strong performance: 0-62mph takes 9.1 seconds while 380Nm of torque ensures there is adequate pull in all six gears. Ride quality is excellent and its low driving position gives an engaging drive. 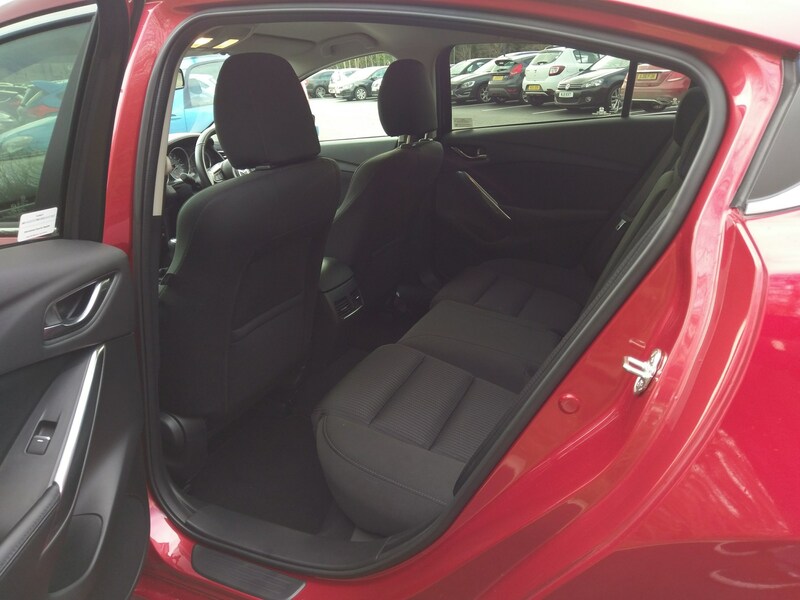 Both front and rear passengers have plenty of leg room, while the boot is generous at 480 litres. 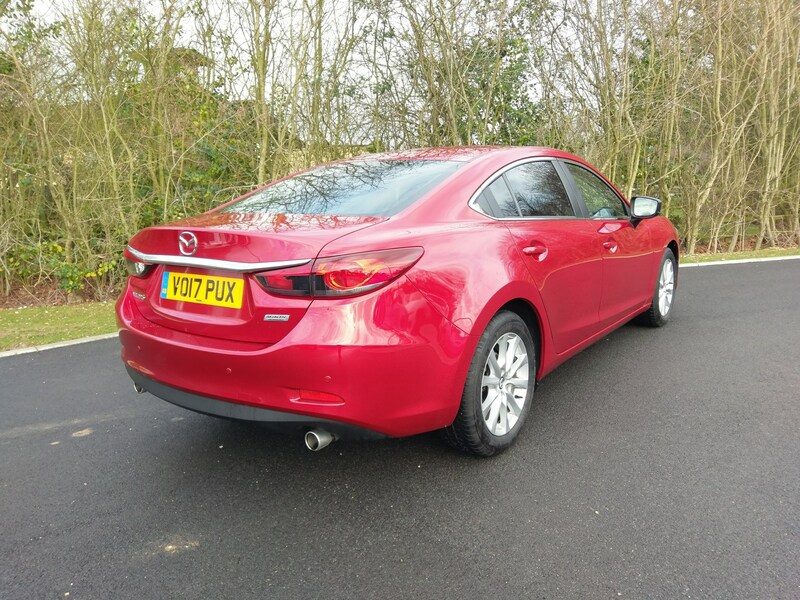 We’ve always been convinced that the Mazda 6 is an excellent company car choice and the latest updates make it better value for money and even more enjoyable to drive.